In the days after the Parkland, FL school shooting, students and activists have called on their peers around the country to demand action-and they are answering by the thousands. At demonstrations and candlelight vigils across the U.S., crowds chanted “no more guns.” At a Fort Lauderdale anti-gun rally, Parkland survivor Emma Gonzalez called “BS” on common objections to gun control — and video of her, too, went viral. Now, across the country, students are planning to stage walkouts in protest of gun violence. So far, two massive nonviolent protests have been organized: the National School Walkout on March 14 and the March for Our Lives on March 24 where an estimated half million people will march on Washington, D.C. to demand gun reform. Nonviolent methods spread between neighboring countries through a ‘spillover effect’. Although most research focuses on the country-country level, nonviolence is contagious because it works. Because of its success, we can expect to see the same spread of nonviolent methods at the micro level [communities] as we do at the macro level [countries]. 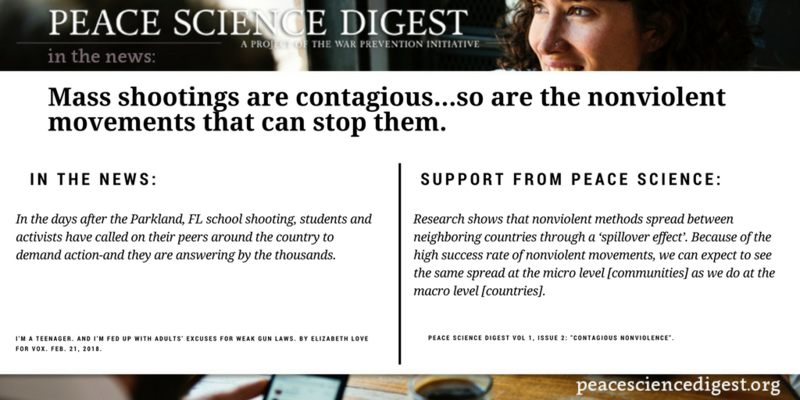 Peace Science Digest Vol 1, Issue 2: “Contagious Nonviolence”. “I’m a teenager. And I’m fed up with adults’ excuses for weak gun laws”. By Elizabeth Love for Vox. Feb. 21, 2018.